Food is a business and dog food is no different. That means that the primary concern of those producing the food is to make money. Recently, while meandering through my local pet store I walked through the dog food aisle. Both my dogs are on a home-cooked diet so I don’t frequent this aisle but I stopped to have a look and couldn’t help reading a few of the nutrition claims made on the labels. Of course, the implication of ‘natural’ is that it already exists in nature and therefore it’s healthy. But arsenic exists in nature and you wouldn’t want to add that to your dog’s breakfast. This claim is made possible because the FDA doesn’t define what ‘natural’ actually means and the AAFCO’s definition is so broad that it encompasses everything other than artificial preservatives, flavors and coloring agents and synthetically produced vitamins and minerals. Even when these latter two ingredients are used, the label can still read “natural with added vitamins and minerals”! No doubt meant to motivate our ‘inner hippy’ this term is also meaningless. Most people’s understanding of ‘holistic’ is wholeness or completeness and yet food that is promoted under the holistic banner has been shown to contain the same ingredients, grown or raised in the same way as other non-holistic products. They have no unique properties at all. No food produced in a pet food factory, no matter how good it may be, can be legally classed as human grade. Many manufactures get around this fact by instead claiming that their products are “made from human grade ingredients”, “with human grade meat” or “ingredients fit for human consumption”. But again the statement doesn’t really mean anything. Although many ingredient’s may enter a manufacturing process as “human grade” based on the way it was produced and transported (every producer of those ingredients must be licensed to perform those tasks), the manufacturer must then meet stringent hygiene and processing requirements for them to remain “human-grade”. 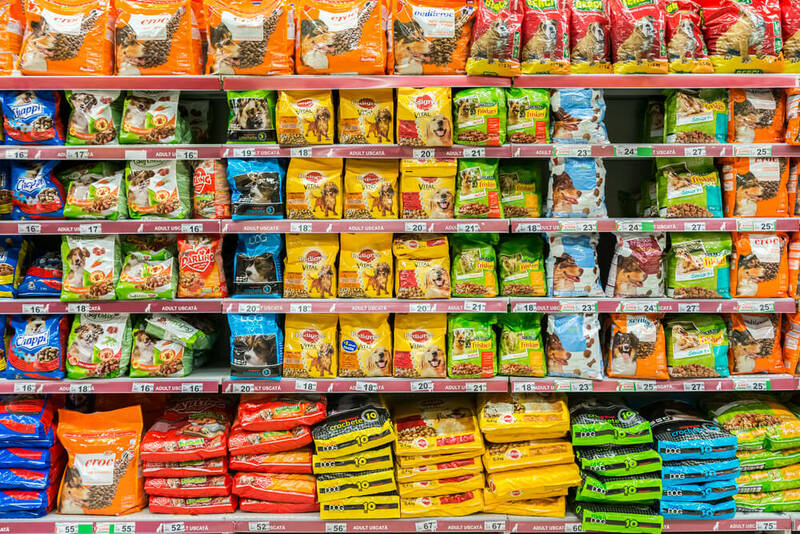 Few pet food companies can meet these criteria. We love our dogs. Dog food manufacturers know this and so they add “premium” or “gourmet” to the label so we feel as though we are giving our dog the very best. More often than not there is no real difference between the premium product and the non-premium product other than the price. It’s impossible for a complete dry dog food to be “100% organic” because vitamin and mineral supplements must be added and they can’t be organically produced. If a manufacturer states their dog food is “organic” the food must contain at least 95% organic ingredients and must identify the organic ingredients in the ingredient list i.e. “organic brown rice”, “organic chicken”, “organic poultry meat” etc. If a food is labeled “Made with organic ingredients” – it’s a different rule again. This time the food must contain at least 70% organic ingredients and again, the organic ingredients must be identified in the ingredients list. But what’s in the other 30%? One thing is for sure; genuinely organic ingredients are significantly more expensive to produce which means that the dog food will almost certainly contain less meat than non-organic dog food and cost more. “Hypoallergenic” is another popular claim and it’s used to describe any ‘limited ingredient food’ that doesn’t contain anything commonly linked to allergies. This may sound sensible, especially if you have a beloved family member with a sensitive tummy or itchy skin …until you realise that any individual dog can be allergic to any protein source or any particular ingredient – limited or not. So ‘novel’ or ‘limited-ingredient foods’ can’t really be considered non allergenic. For these reasons, IMO, ‘hypoallergenic’ is misleading. While nothing ever works for all dogs, I’ve had much better luck managing food allergies and sensitivities in dogs using a hydrolyzed food or home-prepared diet. Manufacturers know that we love our dogs and we want to give them the very best we can afford so they make a variety of health claims from “promotes a glossy coat” to “helps maintain healthy joints and mobility” to “supports a healthy immune system” and beyond. The list is endless and meaningless. Shouldn’t all complete foods support health by definition? There are pet food companies who take great care in choosing the ingredients for their foods but if you really want to give your dog nutritionally balanced, healthy food then consider making your own food – that way you know exactly what your dog is eating.